In the tradition of Behind the Beautiful Forevers and Nothing to Envy, this is a masterful, humane work of literary journalism by New Yorker staff writer Alexis Okeowo--a vivid narrative of Africans, many of them women, who are courageously resisting their continent's wave of fundamentalism. In A Moonless, Starless Sky Okeowo weaves together four narratives that form a powerful tapestry of modern Africa: a young couple, kidnap victims of Joseph Kony's LRA; a Mauritanian waging a lonely campaign against modern-day slavery; a women's basketball team flourishing amid war-torn Somalia; and a vigilante who takes up arms against the extremist group Boko Haram. This debut book by one of America's most acclaimed young journalists illuminates the inner lives of ordinary people doing the extraordinary--lives that are too often hidden, underreported, or ignored by the rest of the world. 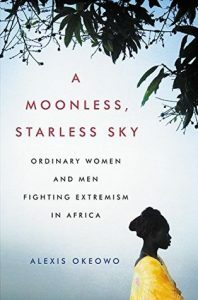 Alexis Okeowo’s A Moonless, Starless Sky writes about the lives of four individuals in Nigeria, Somalia, Mauritania and Uganda who are resisting against the extremisms they each face. Okeowo, a first generation Nigerian-American, manages to deftly weave hope and inspiration in her solemn, yet conversational, exploration of the bravery and courage these four individuals face in abject terror. The four narratives are about an LRA child soldier and the girl forced to marry him, a man and his fight against slavery in modern Mauritania, a group fighting Boko Haram, and a Somalian young woman’s struggle for the right to continue playing basketball. While each of the stories were eye-opening to read, the story about the Somalian young woman finding friendship, companionship, and fulfillment in playing basketball tugged at my heart-strings the most. To us here in the US, something so commonplace as playing basketball doesn’t register as a forbidden activity for anyone, but for her, it was a forbidden activity, because she is Muslim, because she is female. Her struggle to pursue her dreams resonated with me so much. Okeowo writes the lives of each of these individuals with clarity, empathy, and respect; she writes their stories with unflinching insight to their struggles and triumphs. This book will certainly raise awareness to events happening beyond our media’s reach and inspire people to take action. It’s an absolute must read. 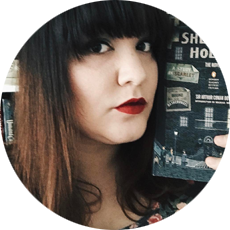 Many thanks to Hachette for sending me a copy of this book to review! All opinions are my own.